Explore our collection of printables for Year of the Dog - perfect for Chinese New Year 2018, or for any children born in a Year of the Dog. There's lots of fun here! As you might expect, those born in the Year of the Dog are thought to be honest, sporting, helpful, generous, loyal and affectionate - as shown in our Year of the Dog poster! Good practice for little hands! Use these cute dog cutting shapes to decorate the house, or stick them to cards and invitations. Perfect for dog lovers, here are some doggy cutting shapes for children to practice their scissor skills on. Carefully cut along the dotted lines to cut out the pictures. Woof woof! Here are some fun dominoes with a doggy theme! Print onto some card, cut out, then laminate or glue onto craft foam if you want to make them a little stronger. Playing with these adorable dog game cards is a great way to help the children improve their memory and learn about matching pairs - just print two or more times onto some card and cut out each card. Do you have someone in your family or classroom who was born in the Year of the Dog? They are sure to love this little bookmark then! Do they share the typical dog characteristics? Send someone this colourful Year of the Dog card to wish them a Happy Chinese New Year. For best results, print using the borderless settings on your printer. Affectionate, loyal, honest, sporting, generous and helpful - these are some of the adjectives used to describe people born in the Year of Dog, and this worksheet asks the children to write a script for a television programme with a central character who possesses these qualities. Help the children to learn their numbers from 1 to 10 with this lovely Year of the Dog counting jigsaw. Just print onto some card then slice along the vertical lines. Children can then use the numbers at the bottom to order the pieces. This lovely Year of the Dog frame is perfect for all your Chinese New Year writing and drawing projects, and the children will enjoy colouring in the pretty frame too. At Chinese New Year, it's traditional to give the gift of a bright envelope filled with money (real or chocolate) to wish good luck for the year ahead. 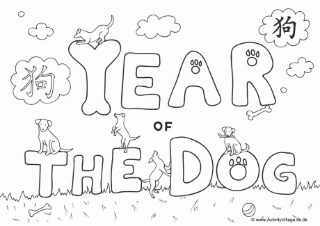 We have both black and white and colour versions of our Year of the Dog jigsaw, designed to help the children learn their ordinal numbers. Print onto some card, then slice along the vertical lines. The children can then put the picture back together using the ordinal numbers to help. This Year of the Dog poster is perfect for brightening up classrooms or any Chinese New Year display, or use as a colourful scrapbook cover. For best results, print using the borderless settings on your printer. We've designed our Year of the Dog spelling jigsaw so you can use it for different ages. For younger children, slice down the vertical lines but leave the letters attached to the bottom row, and they can use the letters to help them put the picture back together. This Year of the Dog story paper is great for inspiring the kids to get writing this Chinese New Year. In the Chinese Zodiac, the dog is the symbol of loyalty and honesty - can the children write a story about someone with these characteristics?